As an aside from research and professional matters, last Saturday evening (8th November) we went to Kings College School Wimbledon for its annual firework display. 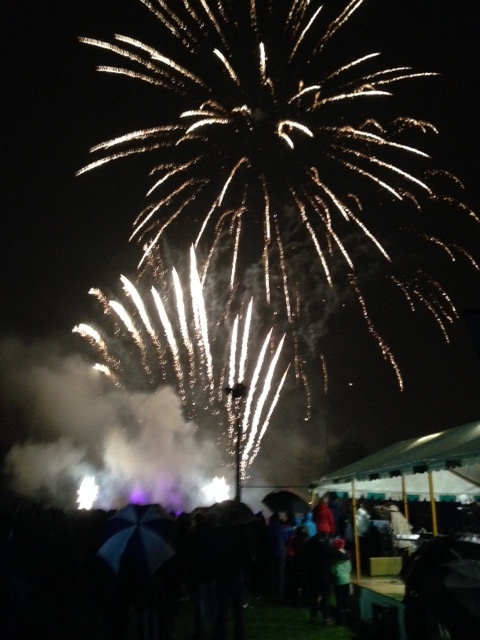 The fireworks were provided by Toby Alloway, an old boy of the school, through Titanium Fireworks. Titanium provided the display for the Opening of the Commonwealth Games in Glasgow earlier in the year. The weather was atrocious and the torrential rain, the mud of the playing fields, the smoke, the flashes and the noise would have been an appropriate nudge in the direction of the appalling conditions of the Flanders battlefields of World War I. Despite this, the Kings College School display was stunning and even more so as it was for a school, albeit a rather good one, rather than a major national or international event. It was a very good evening and a very enjoyable one: to be recommended. This entry was posted in Uncategorized and tagged Fireworks, Kings College School Wimbledon, Opening Commonwealth Games 2014, Titanium Fireworks. Bookmark the permalink.